"A party tonight anyway and I think with these boys, the party could start again tomorrow too," said Donegal manager Mickey McCann after watching his side bring the Cup back to the Hills for the first time since 2013. 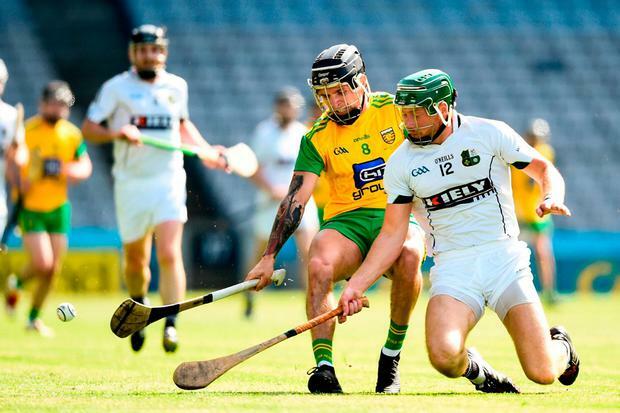 The final score suggests a more comfortable game for Donegal than it was and nobody knows that more than McCann, who had to try to inspire some confidence in his side after seeing Warwickshire take a four-point lead into half-time. "We were sluggish and they were outworking us. They punished us with any chance from distance, and we felt our forward line was letting the ball out too easy so they got a chewing at half-time and they changed things around," he said. "That's a very impressive forward line we have there but sometimes they tend to switch off and the heads drop but they settled down again and believed in their ability to take the win." Describing the forwards as 'impressive' was a major understatement from McCann, they relentlessly pestered Warwickshire in the second half and within eight minutes of the restart had eliminated the deficit. Declan Coulter and Gerry Gilmore led the charge for Donegal, with the former bagging 1-10. Coulter's goal was a wonderful individual effort in the 54th minute after Donegal fans had been treated to an unstoppable 25-metre effort from Gavin Browne just moments before. 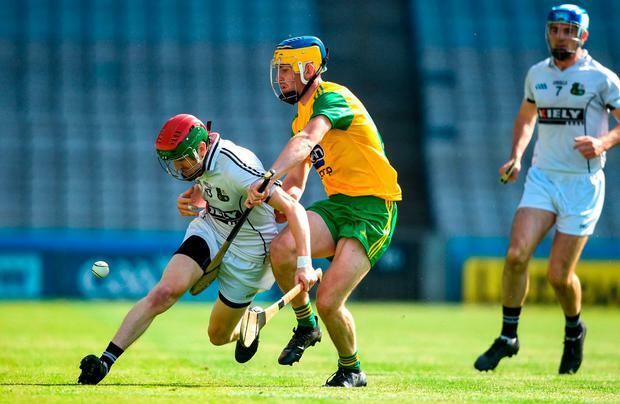 Warwickshire battled hard even after Shane Caulfield's dismissal but were unable to break down a Sean McVeigh-led Donegal defence. "One thing we work on is no goals if possible. When Warwickshire got inside us, we gave away 'good fouls', as they say," said McCann. "We'll sit down now and look at things but if the group of players stays together, we'll compete in 2B again next year and being in the Christy Ring will be huge for these boys." Scorers - Donegal: D Coulter 1-10 (0-4fs, 0-1 '65'), G Gilmore 0-4 (2 s/l), G Browne 1-0, B Lafferty, D Flynn 0-2 each, C Mathewson 0-1. Warwickshire: N McKenna 0-12 (8fs), S Caulfield 0-2, P Hoban, C Robbins, D Nugent, N Kennedy 0-1 each. Donegal - P Burns; P Doherty, C McDermott, S Gillespie; J Donnelly, S McVeigh, G Browne; C Mathewson, D Cullen; C Finn, D Coulter, R McDermott; B Lafferty, G Gilmore, D Flynn. Subs: N Cleary for Donnelly (h/t), E McDermott for R McDermott (57), K Campbell for Finn (58), L Henderson for Flynn (65). Warwickshire - P Crean; W Allen, D Bruen, M O'Regan; P Scally, P Hoban, D Kennedy; J Collins, S Caulfield; C Robbins, N Kennedy, N McKenna; D Nugent, P Uniacke, G Lennon. Subs: K Magee for Collins (43), R Curley for O'Regan (58), I Dwyer for N Kennedy (62), K Boxwell for Robbins (65), K Phelan for Allen (72). Joe Canning will learn in the coming weeks whether it is viable for him to play some part in this year’s Leinster SHC following recent groin surgery.